I have been working long hours for the last few weeks and finally caught up around the garden today with Rod. 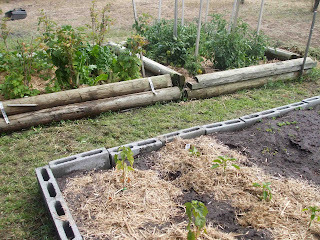 We mulched everything and started off another garden bed ready to plant our berries in a few months. Our tomatoes are heavily fruiting which means it shouldn't be too long before I can make chutney and sauce. We are still getting a few raspberries and our silverbeet is doing really well. We also have Capsicum, Brocolli, Cabbage, Spring Onions and Zuchinni planted at the moment. We have just sewn pumpkin and carrot seeds and will plant them out in the big garden just as soon as they are big enough. 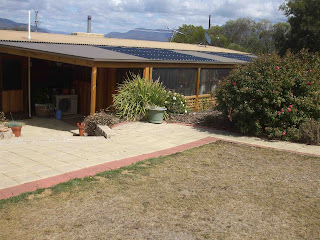 Here is a shot of the breeze through which we recently built at the back of our house. It is a great area which gets lots of sunshine. It has pull up bistro blinds which help protect it. And here is an updated shot of our herb garden. Do you remember a few weeks back when we planted them all. Haven't they grown? We have been cutting lettuce from here as well as coriander, parsley and chives. We also have Basil, Marjoram, Spearmint and Mint. I have a few projects on the go at the moment and will take some pictures this week of the progress of some. WOW look at those herbs. I will have to come veggie shopping at your house. It looks so nice. I have been thinking of a veggie patch but with the weather we are having at the moment, I will have to leave it for a little while. Your garden looks amazing. You obviously love your garden Fiona, it looks great. I've never heard of a breeze through tho, but it looks handy to have. Don't forget to enjoy your breeze through. 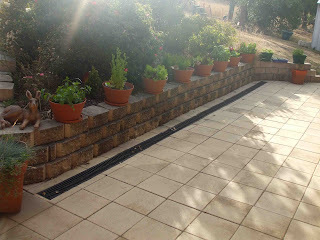 Hi Fiona, I love the pots of herbs on the wall, you have made them ornamental as well as useful. Everything looks so pretty and well-cared for! My garden is always a mess. Your vegies are doing well. Mine are pretty much fried after all this hot weather.